The new CDS-7500s Thermal Desorption autosampler from Analytix provides a robust solution for the challenge of transferring Volatile and Semi-Volatile samples for Gas Chromatography (GC) analysis. Uniquely the CDS 7500s does not require extra gases or peltier/cryogenic cooling. Utilising pre-heated trap technology provides improved chromatography with better handling of wet samples for a streamlined and more reliable transfer of analytes on to the column. All heated zones can operate up to 350oC that ensures even less volatile compounds can be analysed. Applications include EPA 325, TO-1 and TO-17, emission testing, thermal extraction of PCBs/PAHs, and personal exposure testing. As with all CDS thermal sampling products, the quick-connect, high temperature transfer line allows users to easily interface with all makes and models of GC. The easy to use intuitive control software works in tandem alongside any GC system with auto-start functionality. 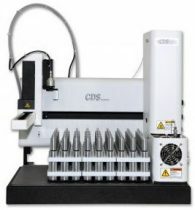 Key features include: No cryogenic or additional gases, 72 sample capacity, robust pick and place X, Y, Z autosampler, auto leak checking, high temperature heated transfer line up to 350oC, and compatible with all industry standard TD tubes from 3.5” – 7”.